Almost to a resolution ~ but, then! Thank you for your patience in waiting for this page, I know it’s been a couple months ^^; That said – we’re very close to my first goal on Patreon, $50 monthly, for which I would guarantee a new page each month!! So if you’re not pledging yet but enjoy reading Tock’s story, please do consider signing up! Lastly – Happy Orctober, too!!! I will be participating in that, even though I’m having a bit of a late start. More about that on my Instagram. This week, we’re talking about how Gnomish/Orcish trade usually happens. And here for previous WBW’s. Well, someone’s had enough of this conversation she can’t understand. Also – backgrounds, wooo! After so many pages of very little background, this was a challenge and I’m quite pleased with how it turned out. Between that and the rush of action in the first 4 panels (and those being so tightly packed together) I really wanted this page to snap us right back into the reality of what’s going on – i.e. the very real, potential danger for all three of our heroes. We’ve gotten to focus on just the mystery of Onna’s situation a bit for the last few pages, but there is a lot more going on than her reluctance and Tock’s curiosity. Also also please, if you’re interested in me posting a translation guide for the Orcish, raise your hand! 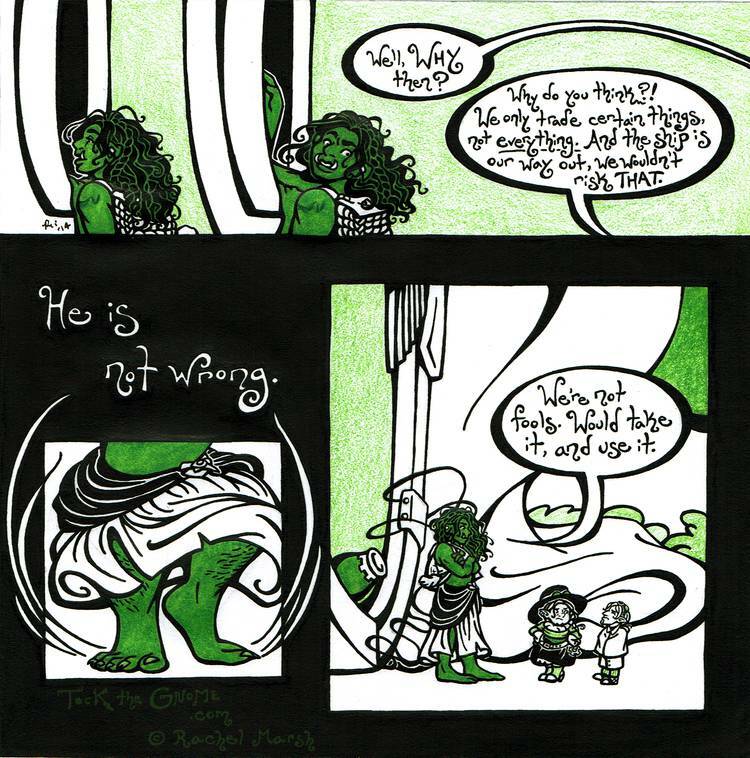 Getting much closer to actually being able to mention the Orc Lady’s name, thank goodness.